Ever wonder what makes Bowser so angry all the time – kidnapping Princesses, taking over castles and all that other bad stuff he tends to do. Well now you can find out! 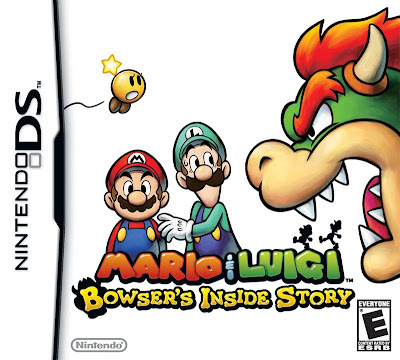 In Mario & Luigi: Bowser’s Inside Story you get to play and adventure as both the famous Mario brothers and even Bowser himself. Take control of Bowser and take back control of your castle from the evil Fawful, and in an independent story line help Mario and Luigi as they try to escape from Bowser’s body (yeah, just like the movie Inner Space – they go inside Bowser). Switch between the two storylines as you attempt to rescue Princess Peach (yet again!) and restore order to Mushroom Kingdom. Controls for M&L:BIS will have you pressing buttons with precise timing to enhance their attacks, tapping the touch screen, blowing into the microphone and even turn the whole game system sideways to overcome obstacles. Puzzles, character battles and your typical humorous Mario style dialog. This looks like a great title for the DS, one that should amuse any Mario fan.